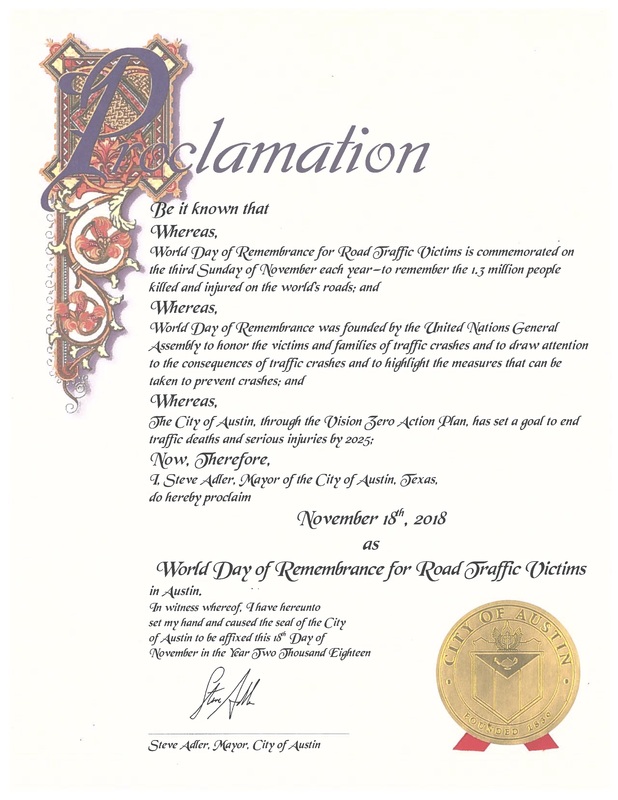 Austin Mayor Steve Adler has proclaimed November 18, 2018 as World Day of Remembrance for Road Traffic Victims in Austin. In November of every year Texas marks a grim anniversary. Every single day, for the last 18 years, a family has lost a loved one to traffic violence in Texas. But the losses are even bigger than that, because an average of 10 people die every day using our freeways, streets, and roads. Most people who die are riding in cars and trucks, but the state is also particularly dangerous for walking, motorcycles, and biking. “Every kid in every neighborhood deserves residential streets designed for safe speeds for kids walking, biking, and playing,” says Kathy Sokolic, Chair of Vision Zero ATX. A growing group of nonprofit organizations and community groups believes that we can end traffic deaths in Texas. The coalition is gathering this Sunday, November 18, 2018, for the local edition of the World Day of Remembrance for the Victims of Traffic Violence. “City, county, and state agency staff do heroic work every day to fix our dangerous roads and streets, but we need leadership from the legislature to give TXDOT and others the tools and funding they need to end traffic deaths,” said Jay Blazek Crossley, of Farm&City. Vision Zero is an international movement for governments at all levels to set a goal of zero traffic deaths or severe injuries and make a commitment to a shift in how we design and use our transportation systems to prioritize the preservation and quality of human life. The coalition is advocating for four major components in the next legislative session: safe neighborhood streets, a consistent statewide hands free law, stop for pedestrians law, and an overall target to end traffic deaths in Texas. “I was appalled to learn that in Texas more than 600 people per year die in traffic while walking. An average of two Texans per day loose their lives simply doing what humans have done throughout history. Walking is the most basic, healthy, and inexpensive transportation option we have and should not be a potentially deadly activity. All Texans deserve a safe place to walk,” said Heyden Black Walker, of Reconnect Austin. For more information on the event, the legislative agenda, or how to get involved or donate to support this work, please see VisionZeroTexas.org.